Home / 30hands Getting Started Course & Help Site / What does "Display Update in Timeline" mean? In a 30hands course, instructors have the option to choose which information they upload will become visible for all students. 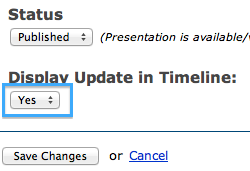 For example, if an instructor were to upload a new quiz, they can choose to display the update in the “Timeline”. The “Timeline” is found in the gray Course Pages box underneath the Home tab . Whenever you add material to your course, you will have the option to “Display Update in Timeline” which is located at the bottom of the page. If yes is chosen, students will receive an email notifying them of new activity based on their individual account preferences. If no is chosen, students will not receive an email and the update of activity will not be posted on the homepage. 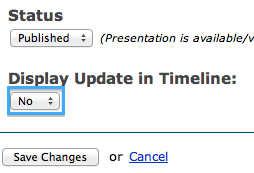 When you choose to “Display Update in Timeline”, there will be an update posted on the Course Timeline. This is an ideal option when posting new material such as quizzes, presentations, or assignments. Click the “Save Changes” button located directly below to save your settings. When you choose not to “Display Update in Timeline”, there will not be an update posted. This is an ideal option when making minor changes.